VPS18 monoclonal antibody (M02), clone 2G10. Western Blot analysis of VPS18 expression in Raw 264.7. 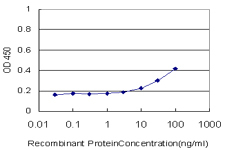 Detection limit for recombinant GST tagged VPS18 is approximately 3ng/ml as a capture antibody. VPS18 monoclonal antibody (M01), clone 4F8. Western Blot analysis of VPS18 expression in Raw 264.7 ( Cat # L024V1 ).